This spicy chicken and black bean soup is one of my family's favorite slow cooker soups. I seem to make it at least 2-3 times a month for dinner--and there are never any complaints when I pack everyone soup leftovers for lunch! While I sometimes use fresh corn, homemade salsa and dry black beans--I have been known to swing through the grocery store for canned and jarred ingredients as well. Today is parent-teacher conference night at my middle daughter's school and I am actually making this soup for a PTO potluck dinner for the teachers. In a large slow cooker, place the chicken, salsa, green chilies, cumin chili powder, garlic powder and vegetable stock. Cover and cook on high for 4-5 hours or on low for 8 hours. Pull the chicken out from the pot, shred and return to the slow cooker. Add the black beans, corn, and vegetable broth. Stir in the refried beans and mix it in well to remove clumps. 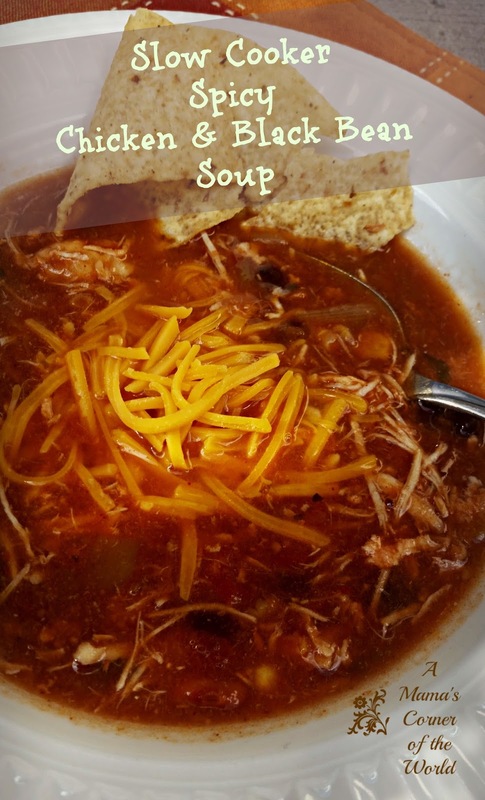 Garnish the bowls of soup with shredded cheese, tortilla chips and salsa if desired.